One of the largest convenience food retailers in the South has acquired premises in Berkshire for its investment portfolio. Commercial property consultancy Vail Williams LLP acted for Southern Co-op in the deal for Unit 3, Queen’s Square, Ascot Business Park, Ascot. Salmon Harvester Properties Ltd sold the 2,067 sq ft office to Mutual Associates Ltd, the property trading division of Southern Co-op, with an initial yield of 7%. Russell Miller operates out of Southampton and is a partner at Vail Williams, which manages Southern Co-op’s property portfolio. 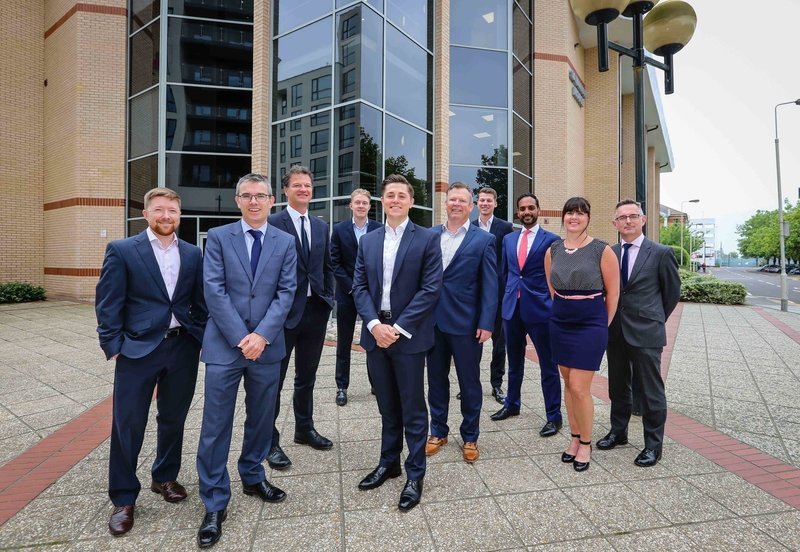 Pictured here on the far left with transactional colleagues at Vail Williams in Southampton, Russell said: “This was an openly marketed investment that we were delighted to be able to secure for our client. “We frequently act for Mutual Associates Ltd, part of Southern Co-op, and are always on the look-out for investment opportunities for this client. Russell added: “Along with advisory work for Southern Co-op, Vail Williams has also been appointed by our client to carry out the property asset management at Ascot, for both short-term returns and longer term growth." HMS acted for Salmon Harvester Properties Ltd, the vendor. Southern Co-op has more than 210 stores in the south of England. Occupiers at Ascot Business Park, developed by Salmon Harvester Properties Ltd, include Swedish bank Handelsbanken and drinks wholesale business Interbev UK Ltd.
Ascot Business Park’s joint marketing agents are Cambell Gordon and BNP Paribas Real Estate.